Willowbrook Meadows Sub is a larger subdivision with homes, duplexes and triplexes for sale in Silverthorne Colorado Real Estate. Located north of Interstate 70 approximately 2 miles, Willowbrook Meadows is a great option for full time homeowners in Summit County, second homeowners and those looking for investment/rental properties. At the entrance to Willowbrook Meadows is Silverthorne’s Trent Park. Trent Park is 3.79 acres with a baseball field, playground, 2 tennis courts, picnic tables and a small kids fishing pond. There are 265 lots in Willowbrook Meadows which consists of 262 built properties and 3 vacant lots. Lot sizes range from 0.02 up to 0.28 acres. 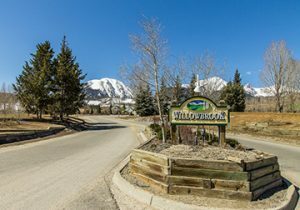 All properties in Willowbrook Meadows Sub in Silverthorne, Colorado have yearly HOA (homeowner association) fees which pay for snow removal, trash and maintenance of all open space. Approximately 70% of the owners are full time homeowners in Willowbrook Meadows. If you are looking for a property in Willowbrook Meadows you will find that property on one of the following streets: Willowbrook Road or Drive, Bighorn Circle, Coyote Drive or Court, Marmot Circle, Chipmunk Circle or Lane, Rabbit Court, Fox Court, Badger Lane or Court and Woodchuck Court. You can view all homes for sale in Willowbrook Meadows Sub in Silverthorne CO Real Estate below where you can also view the properties locations on our new map view. For additional information about a property for sale or to arrange a time to view one of the homes below please call Justin or Krystal Knott at 970.333.9050.